Samuel Kalu has seen his stock rise in recent weeks after a difficult start to his career at Bordeaux and was named in the Ligue 1 Team of the Week for the matches held January 18-20. 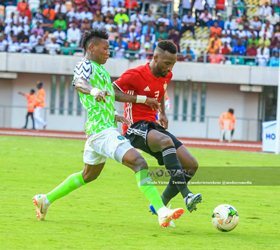 Super Eagles manager Gernot Rohr has spoken about the versatility of Kalu and how he plans to deploy the Bordeaux number ten in three tactical formations ahead of the 2019 Africa Cup of Nations. Since the end of the 2018 World Cup, the former Gent star has made the Super Eagles right wing role his own and was also deployed as a fullback against South Africa in November. ''I watched him several times in Bordeaux and I see his development, he is very good, he had a good adaptation in this new team,'' said Rohr to TV Continental. ''Samuel Kalu is now in my team, a player who can make the difference, he can play in different positions also. Should Tyronne Ebuehi fail to recover in time for the Africa Cup of Nations, Kalu is one of the candidates tipped to replace the Benfica right back. ''Tyronne was injured and could not be invited since the World Cup. He (Kalu) is able to play this position which is very interesting. ''Also the other side now, we have Jamilu Collins, a left footed player who can play in this position. Some players retired like Elderson, so we had to find other solutions and we found them. Kalu has contributed to 3 goals (1 goals, 2 assists) in his last four competitive appearances for the Super Eagles.